Minions, the lovable, pill-shaped, completely nonsensical, banana-loving, yellow henchmen from the Despicable Me series; star in the strangest animated film of the year so far. The Minions origin story, pre-Gru (Steve Carell), swings wildly from inventive and hilarious, to oddly dark and boring in stretches. One of the running gags throughout the film is that the Minions accidentally kill the evil masters they slavingly worship. The death toll is pretty humorous, but quite sinister for a film meant for young children. In fact, I can't think of another animated film that kill characters so flippantly. The macabre moments are mitigated by the blabbering cuteness of the Minions, but it's still kind of weird to see. The opening credits and voice over narration tell of how the Minions evolved before humans. They instinctively are drawn to the worst, most dangerous creature. After accidentally killing off dinosaurs and other pre-historic baddies, they happen upon cavemen and it's a perfect match. Until they kill them too and are chased by angry humans all the way to the arctic. Eons pass, the Minions get bored, and their lives have no meaning. An intrepid minion named Kevin, with two volunteers in tow, Bob and Stuart, venture back into the human world to find a new master. They surface in 1968 New York, where they find out the annual Villain Con is being held in Central Florida. A bizarre road trip later, they're at Villain Con, where the world's most dangerous criminal - Scarlet Overkill (Sandra Bullock), is being honored for her epic villainy. The script by Brian Lynch doesn't successfully hold your interest for the runtime. Minions has a lot of filler that isn't funny and drags down the pacing of the film. The humorous parts, especially the dominicide, are interspersed at key points to keep attention levels up. Lynch does get a golf clap for his shrewd use of the Minions language. Ninety percent of what they say is totally unintelligible. But key phrases like gracias, okey dokey, and I'm sure I heard an 'oye ve', make the Minions understood. An added bonus is the laughable political correctness of the minion-speak. It seems like bits of all languages and ethnic sayings were used to keep the Minions globally relevant. Never underestimate marketing when it comes to a children's film. The animation and 3D effects in Minions will be crowd pleasers. The plot may have dark moments, but the film visually bursts with color and light. There are a few gimmicks where objects come directly at you. These scenes had the younger children in the audience oohing and aahing with glee. It's a mesmerizing parlor trick that adds to the theater experience and props up the lagging moments. 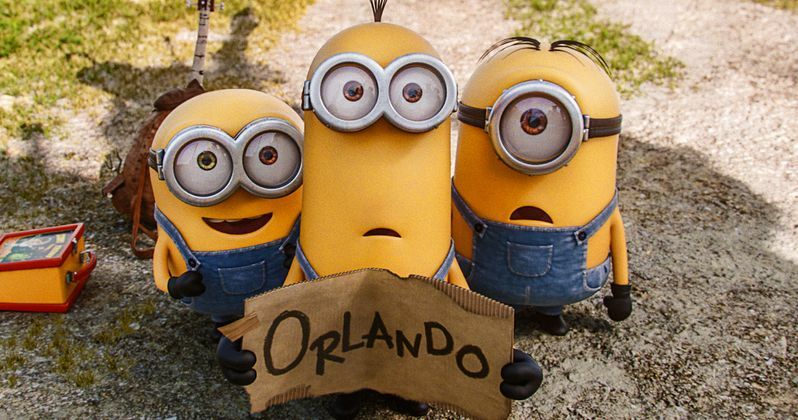 Minions are so damned cute and likeable, it's hard not to walk away with a smile. I may get bludgeoned for saying this...but I'd rather leave the theater on a high note, than soaked with tears from watching Inside Out. Yes, that film has meaning and depth, but isn't fun or entertaining. The only tears you'll get from Minions is by laughing too hard. It's a kid's film, an average one, but will have the nippers begging you for a Minions costume come Halloween.